Dundee (Crocodile Patent) Print "Faux" Leather Vinyl. 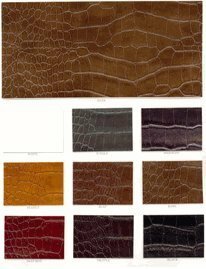 Dundee vinyl has a "patent" high gloss crocodile print pattern, featuring an ultra soft leather feel, with the durability and ease of vinyl. If you want a " patent gloss" crocodile look, without the high price of exotic leather, than Dundee is it! Use it on automotive seating, motorcycle seats, residential furniture, or any other upholstery application that you can think of!